A business that was destroyed by the Camp Fire continues to smolder on Nov. 9, 2018, in Paradise, California. In just a few days, the monster Camp Fire in Northern California tore through a Butte County community to become the state's most destructive wildfire on record. And, it's likely to cause even more destruction. Firefighters do not expect full containment until the end of November. Its rate of destruction places it atop a list of historic wildfires in California, which faced the devastating October 2017 Fire Siege in the North Bay region and the December 2017 Thomas Fire in Ventura and Santa Barbara counties. Below, a look at the most-damaging wildfires on record in California. The figures, obtained from CAL FIRE, are based on the number of structures — homes, barns, garages, sheds, commercial properties and other buildings — that were destroyed. The Camp Fire has burned through Northern California's Butte County with stunning speed. Cal Fire reported more than 10,300 structures have been destroyed since the fire started Nov. 8. The cause is under investigation. The Tubbs fire was the most destructive of a complex of wildfires known as the October Fire Siege in California's Wine Country. The fire, fanned by unrelenting winds in Sonoma and Napa counties, destroyed 5,643 buildings and resulted in 21 deaths, according to CAL FIRE. The fire started in the Calistoga area on the night of Oct. 8, spreading at a stunning rate and burning through entire neighborhoods, forcing some residents to run from their homes in search of shelter. The official cause remains under investigation. Also called the Tunnel fire, the firestorm scorched hillsides in northern Oakland and southeastern Berkeley during an October weekend. Responsible for 25 deaths, the fire rekindled from an earlier grass fire and burned only 1,600 acres — not large when compared to other wildfires on the list. But it was located in a densely populated area with houses and other buildings in its path and ended up destroying 2,900 structures. Fanned by powerful wind gusts, the flare-up grew into a wall of fire that left some residents trapped in an inferno. 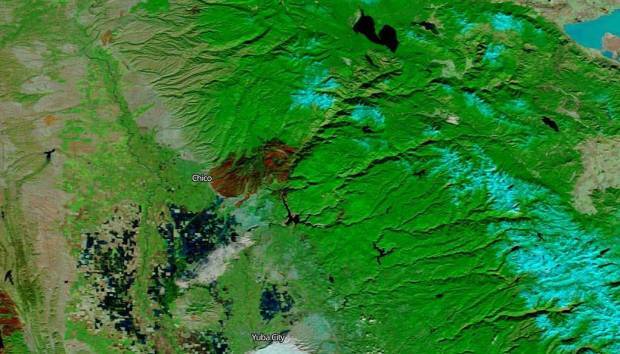 The catastrophic San Diego County Cedar fire is one of the largest in California history. 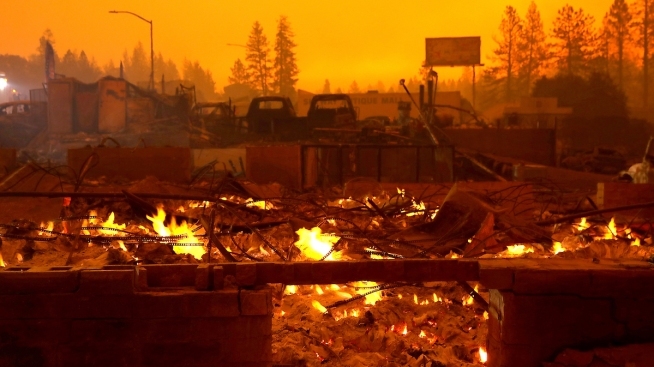 The 273,000-acre firestorm wiped out 2,820 structures and resulted in 15 deaths. The fire was started by a lost hunter who started a signal fire in Cleveland National Forest near Julian. It grew into a burning monster that stormed through wilderness areas and rural communities. The 76,000-acre fire burned nearly 2,000 structures in Lake, Napa and Sonoma counties. In just about 24 hours, strong wind gusts pushed the fire to about 50,000 acres after it was started by a faulty electrical connection that caused nearby dry grass to ignite. Four residents were killed. Damaged power lines caused arcing that set off another monstrous fire in San Diego County. The 197,990-acre Witch fire destroyed 1,650 structures. It burned during an onslaught of large wildfires in Southern California that scorched hundreds of thousands of acres in October 2007. The deadly Carr fire burned more than 115,000 acres in Shasta and Trinity counties as firefighters, mourning two colleagues killed in the firefight, continue to work through sweltering weather. At least 1,604 structures, including about 1,018 residences, were destroyed and seven deaths are linked to the fire. It is the only fire on this list to have burned in July. It is believed that have started due to a mechanical failure involving a vehicle, which sparked nearby brush. Part of a deadly complex of fires called the October Fire Siege, the Nuns fire began Oct. 8 and burned through at least 54,000 acres in Sonoma and Napa counties. At least 1,350 structures were destroyed. The official cause remains under investigation. The fire broke out Dec. 4, 2017 in Ventura County and, fanned by Santa Ana wind gusts, grew into one of the largtest fires on record in California. The fire destroyed 1,063 structures, including homes in Ventura and Santa Barbara counties. Two deaths, including a 32-year-old firefighter, were reported. In January, the city of Ventura sued Southern California Edison, alleging powerlines sparked the fire. The official cause remains under investigation. A 91,200-acre fire that burned 1,003 structures in San Bernardino County was set by a man in a fit of rage after a dispute with his godfather, according to prosecutors. Rickie Lee Fowler, convicted of murder and arson, was sentenced to death. Six deaths were reported in the fire, which began after a lighted road flare was tossed into the brush.